When I was in college and visited the campus rec center for a sweat session, I often laughed at people on the elliptical (coughcouhgTHETAsororitygirlscoughcough). Unlike some people, I wasn’t afraid to sweat. I didn’t go to the gym to socialize, sport my boom-boom shorts, and/or pick-up guys. That’s what the internet is for, right? But I didn’t laugh at them for the laughable reasons mentioned above. I laughed at them because they added no resistance to the elliptical, so that whatever was going on…was not a workout. When you have to put more effort in to slowing or stopping the wheel of a piece of cardio equipment, you’re not doing something right. Kind of like ellipticals needing some effort, so do salads. And just like ellipticals, salads aren’t my favorite. If a salad is going to be a MEAL, it better have some substantial ingredients…like egg, or nuts, or seed, or…cheese. In other words, some fat and protein. Then there’s the facts. Greens and vegetables are packed with fat-soluble vitamins A, D, E, and K that require fat in order to be absorbed. The fat can come from other salad ingredients, salad dressing, or another component of the meal, but the fat should be consumed in that meal for best absorption. 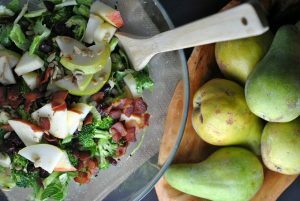 This salad, meets all of my Salad Criteria plus this special wow-factor when the following ingredients are combined. Mmm! To make the vinaigrette, simmer the POM Wonderful over medium heat until it simmers, thickening to about 1/4 cup (about 10-12 minutes). 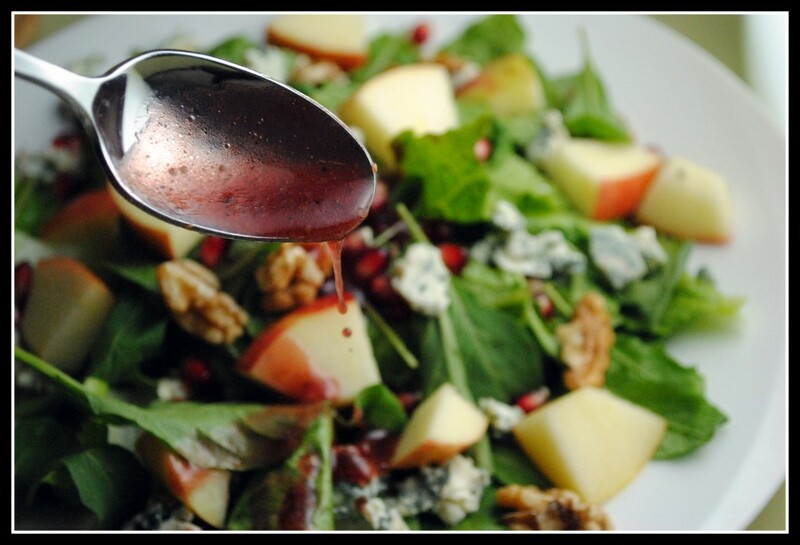 Whisk together the pomegranate juice, vinegar, mustard, honey, salt, and pepper in a medium bowl. Slowly whisk in the olive oil until emulsified. Set aside. 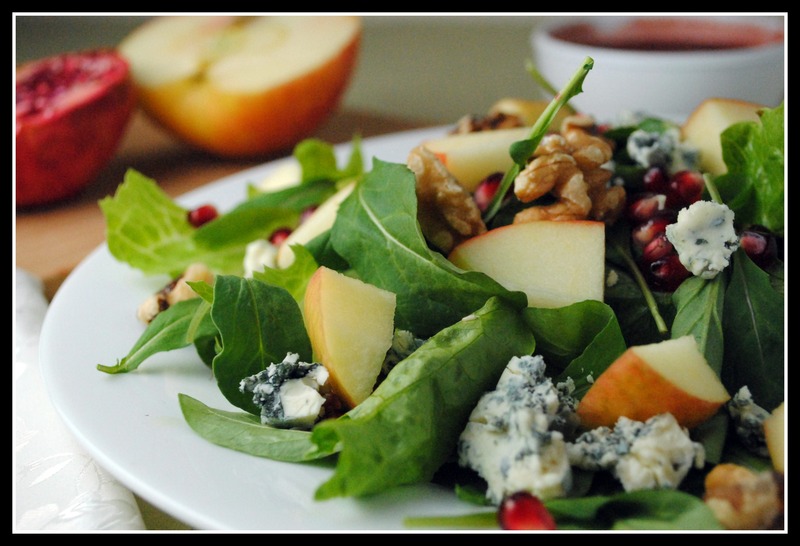 For the salad, combine the apples, spinach/arugula, Romaine, walnuts, and blue cheese in a large bowl. Add the vinaigrette and toss to coat.Â Yield: 5 entree portions. Result: I firmly believe this may be the best salad dressing…ever. It’s absolutely divine. I could eat it with a spoon or slurp it down with a straw. It has a great combination or sweet and tart while still being light and olive oil-based. The ingredients in the salad are perfect for fall and the blue cheese makes this salad outta-this-world. Enjoy! This salad sounds amazing Nicole. And, I agree, a salad isn’t a SALAD unless it has some real “meat” to it, like eggs, nuts, bacon, cheese, SOMETHING! Our friend had us over for dinner on Saturday night and made us “salads” with lettuce and croutons. hehe, it was….interesting. Oh, and BY THE WAY, I was a Theta!!!!!!!!!!! Yes! Love! Want!!! 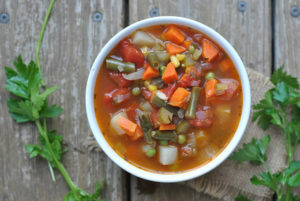 Making this for lunch…soon! 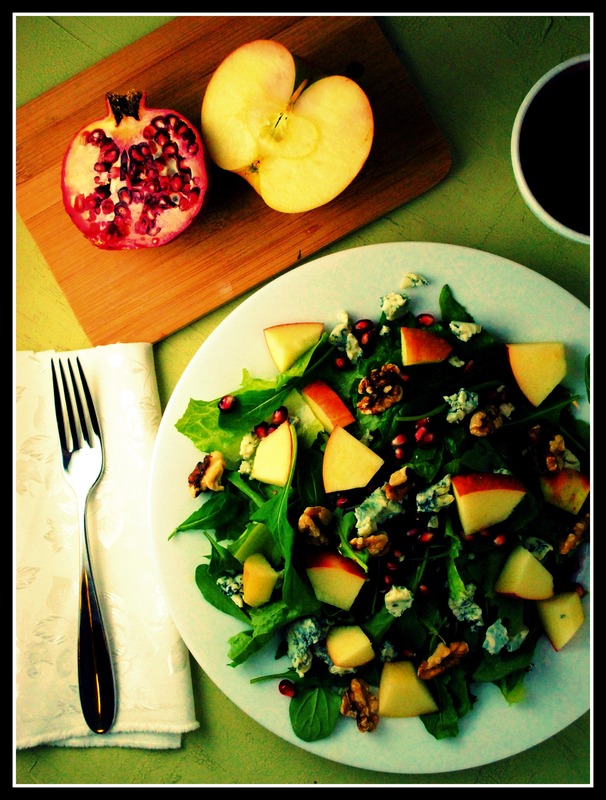 I love the combo of blue cheese and pomegranates– yum! The vinaigrette was the star of the recipe, for sure! This salad has everything I love. I can’t wait to make it! The salad looks so refreshing!! I absolutely require any salad I eat to contain cheese. Now Im glad because I didnt know that thing about the fat and the nutrients. This salad sounds amazing. Its pretty much just a combination of everything I love. This salad looks so amazing! Very groumet looking! I wish I were able to eat blue cheese right now! I’ll have to bookmark this recipe for when I can get it again!!! This is a salad right up my alley! I love salads like this! Looks beautiful, too! 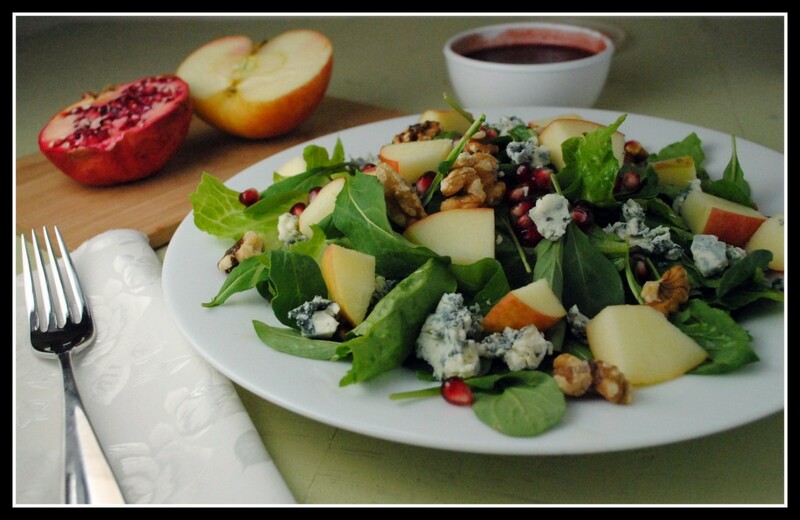 There’s something about blue cheese and fruits together that make a salad amazing. Or really anything. I’ve been know to just eat pear and blue cheese together and lived every bite! Hope your Monday treats you well. Look at you putting some pizazz into your photo 🙂 Nice touch. I’m with you, if I’m going to go for a salad, it needs something substantial in it. I wish I thought to make big salads at home more often. I don’t love fruit in salad, but the walnuts and bleu cheese sound amazing! Oh, lovely! This is my kind of salad. I completely agree with you about salads! There has to be something to them. This looks like one that is not only delicious, but will keep me satisfied. That is one big reason I hardly ever pack salads for lunch. Your pictures are stunning, Nicole! I love everything about this salad and it sounds like it’s absolutely perfect for fall! Nicole, your photos are AMAZING!!! Makes me want to reach my fork through the monitor and dig in. Thanks for the great recipe!!! Have a wonderful week!!! !